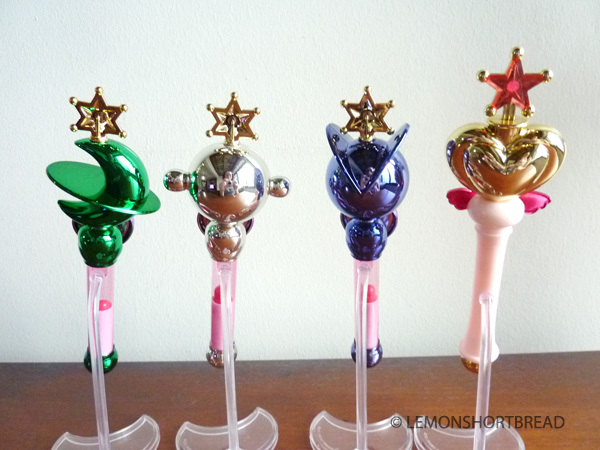 Finally completed the Bandai Sailor Moon Wands Can Gashapon set so here is my review! I bought them from Ebay in sets of 4 over several months. They came in opaque pink plastic bags without the cans. 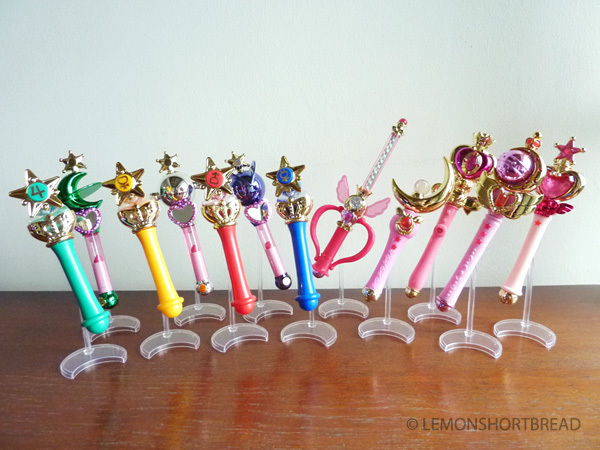 These wands are also repackaged in boxes sold individually in the US. I'm pretty sure they are the exact same thing. I paid about US$26 to $29 per set, including shipping. They originally retail for 500yen each in the machines. These are miniatures, not life-sized. They are made of lightweight plastic and are inexpensive display toys which require simple assembly and come with a transparent stand each. They contain small parts. 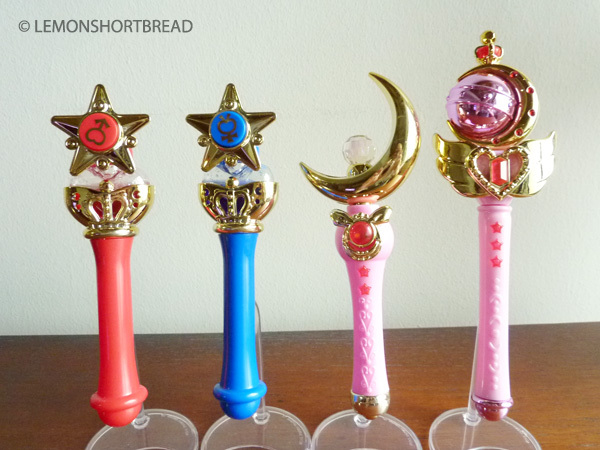 Set 1 includes Sailor Mars & Mercury's Transformation Wands, Sailor Moon's Moon Stick and the Cutie Moon Rod. They were released in Nov 2014. Closeup of Mars and Mercury. 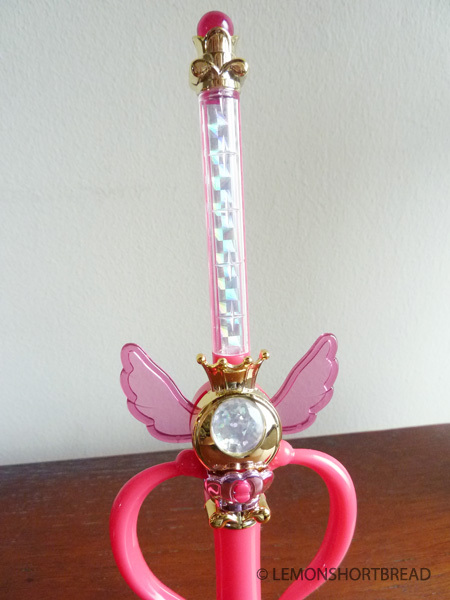 The bottles are just sitting in the holders and will certainly fall out if you decide to do some twirling! They may also slip out when tilted. The bottles are filled with coloured water and glitter. The caps do not open and are glued shut, the glitter tends to stick to the walls of the bottle. The stars slide over the caps with a C-shaped fastener. These are not tight and will remove easily. Back view. They don't look as nice as the fronts and are no frills. 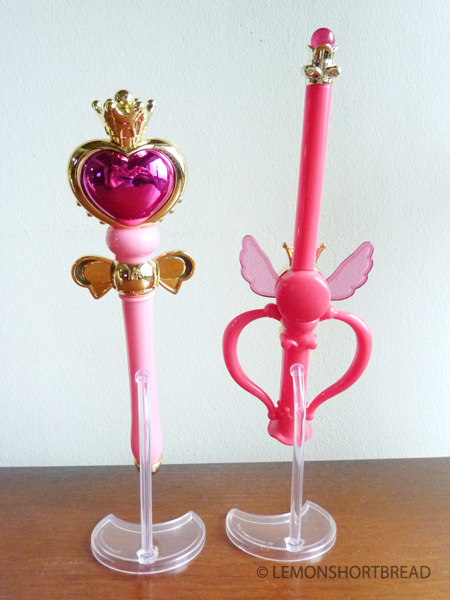 The stands are a nice addition for displaying the wands, however they are quite flimsy! Most of the wands tend to fall off the stands when wobbled or held, as they are not tightly secured or heavy enough. This may seem trivial, but I've toppled the wands many times which is very annoying to say the least. 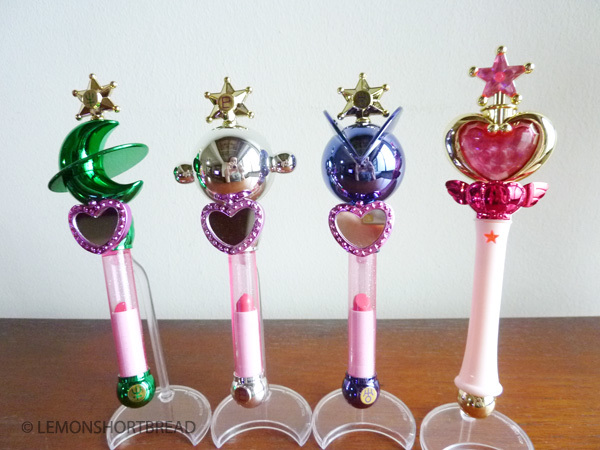 The Moonstick is my fave. 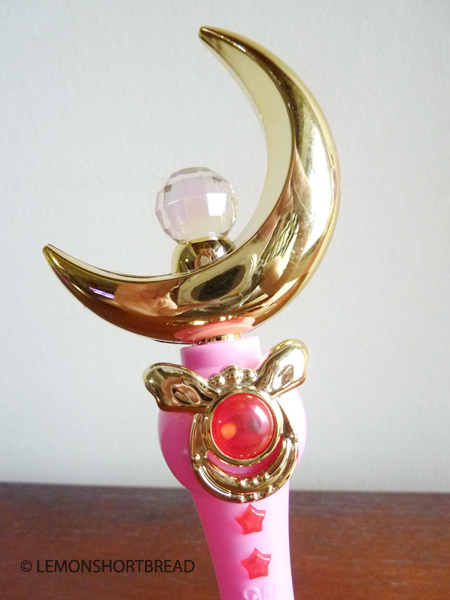 However, the lousy stand came loose again and the stick fell onto my floor and badly nicked the crescent's gold. The gold does not hold up well and is very thinly applied. 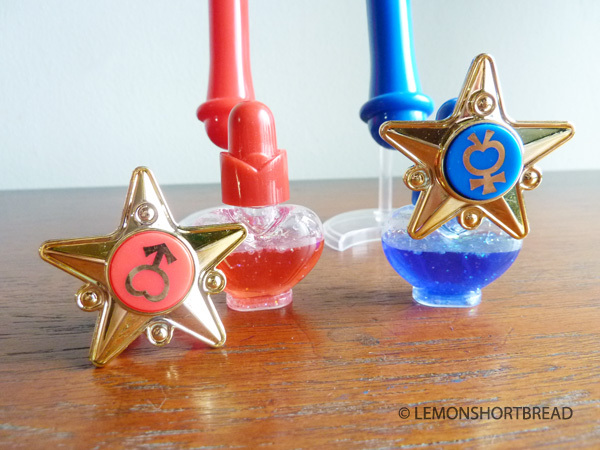 These are just gachapon standards so keep in mind they are like children's toys grade; kitschy, and for fun only! The faceted globe on the top has an iridescent coat. It looks to be glass. Good thing I didn't crack it! 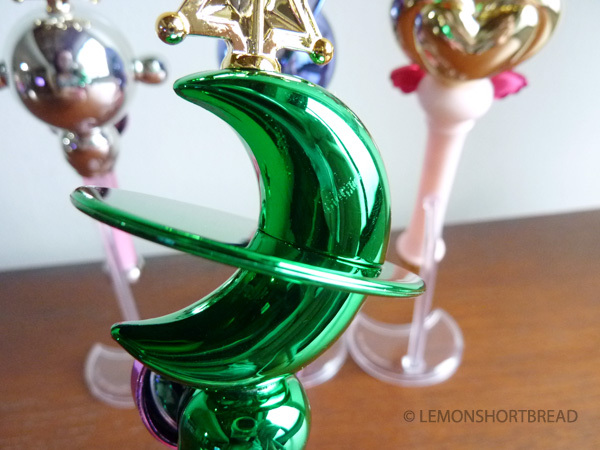 The goldtone plating on the crescent was not perfect when I received it initially. The surface was scuffed and dull on some areas, and a gold-polishing cloth did not buff it off. It could be from shipping or the packaging process so that is another thing you should expect, unless they were in the boxed form. 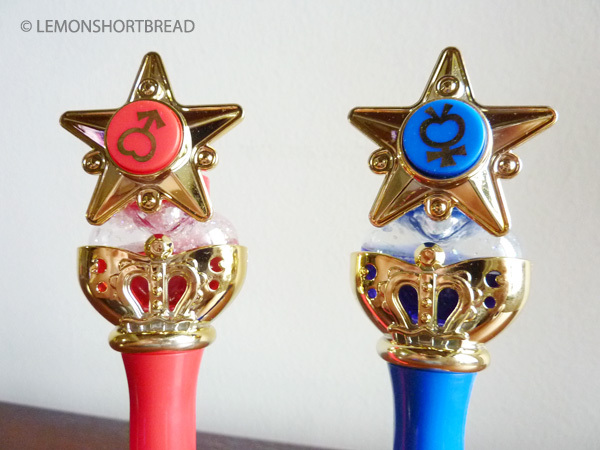 The nicks on my moonstick... sigh. Keep them in a cabinet and don't ever touch them again and they'll be alright. 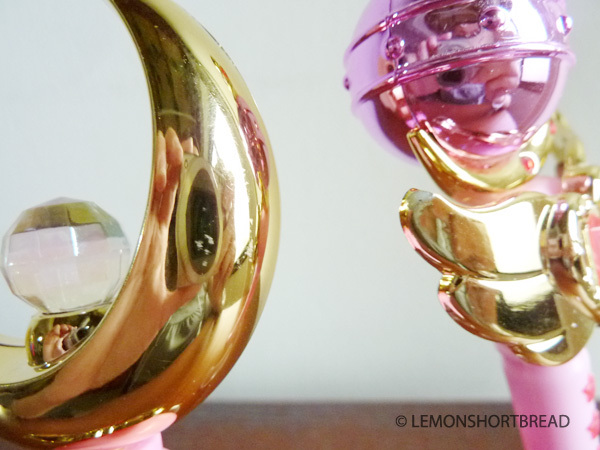 For some reason the gold started wearing down at that corner (left side) of the Cutie Moon Rod, revealing white! I really don't know how that happened, so that's another piece ruined!! You can't see the flaws before unpacking as they are in opaque bags. 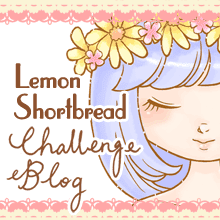 Maybe you will have better luck! 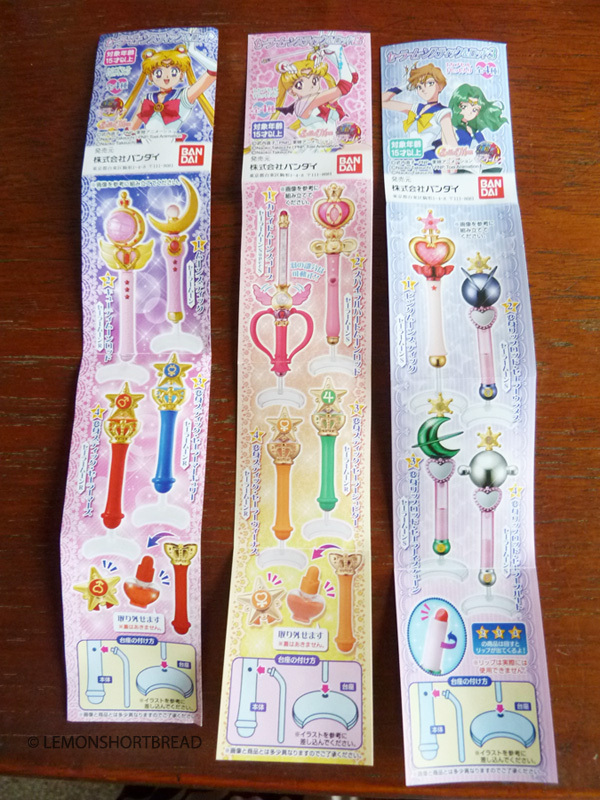 Set 2 includes Sailor Jupiter and Venus' Transformation Wands, Sailor Moon's Heart Moon Rod and Moon Kaleidoscope. They were released in Feb 2015. 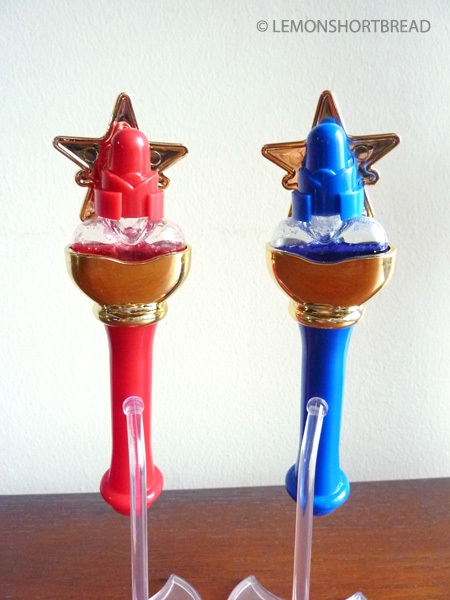 Venus and Jupiter's wands are similarly made to Mars and Mercury's except the bottles are filled with coloured sand. Again, the caps are glued shut. I noticed the goldtone on the symbols tend to scuff and are a bit patchy. 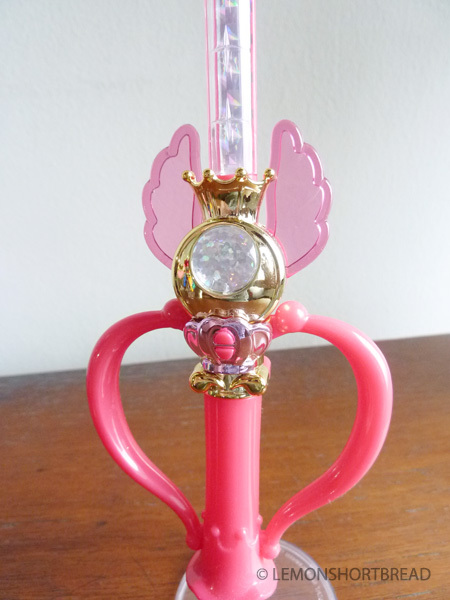 Heart Moon Rod (Spiral Heart Moon Rod). 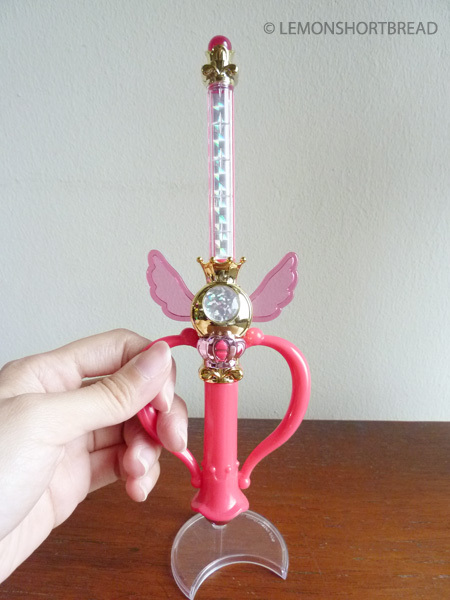 The translucent pink wings can be moved a little bit manually. The 'buttons' don't actually press. The kaleidoscope effect part is made of prism stickers sealed behind the plastic. 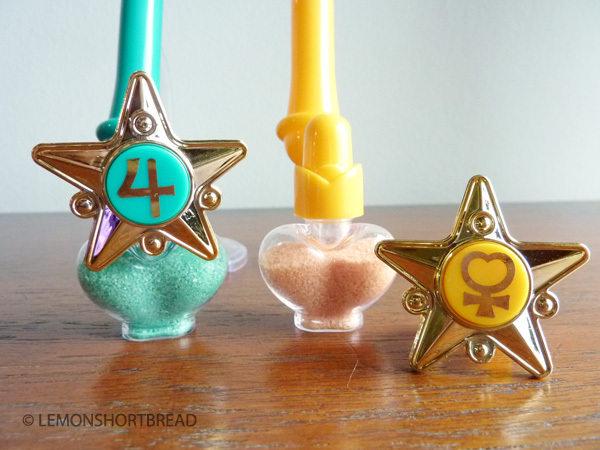 Set 3 includes Sailor Neptune, Uranus and Pluto's Lip Rods and Sailor Chibimoon's Pink Moon Stick. They were released in April 2015. I prefer they include Saturn! 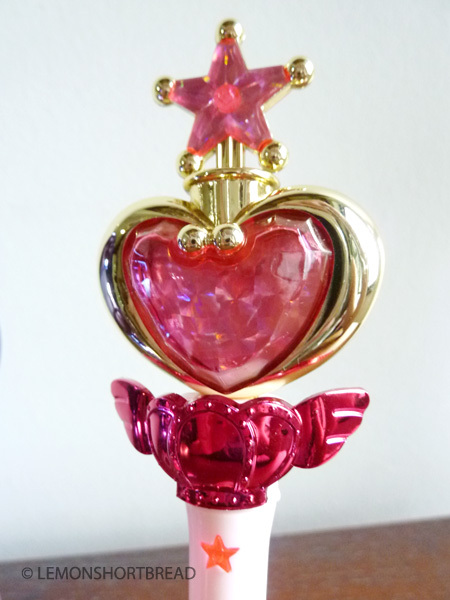 Apologies to Chibiusa's fans but yeah give me Saturn anytime. 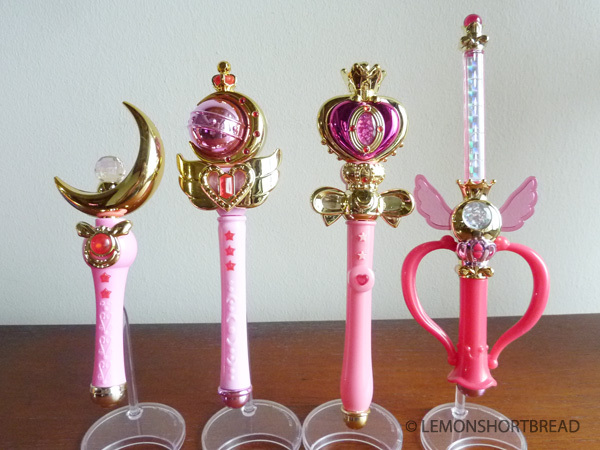 Obviously this set would appear more coordinated if it was all the outer senshis, but I guess Chibiusa is more popular than Saturn? Or Saturn's lip rod is just too obscure it doesn't deserve a release? 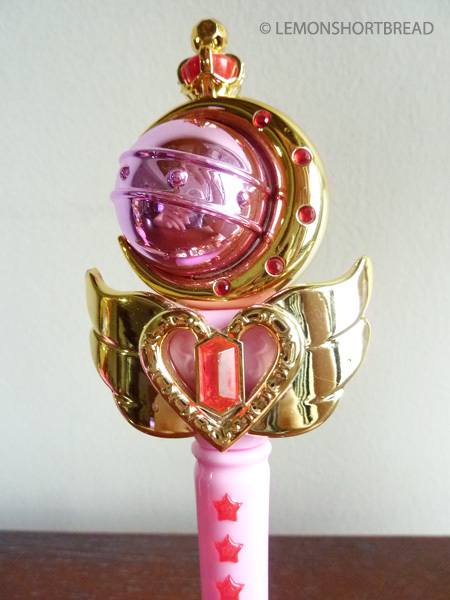 So will there be a Saturn wand after all, since the set is incomplete? I like the planets they are nice, fat and shiny. Sorry I separated Neptune and Uranus lol. 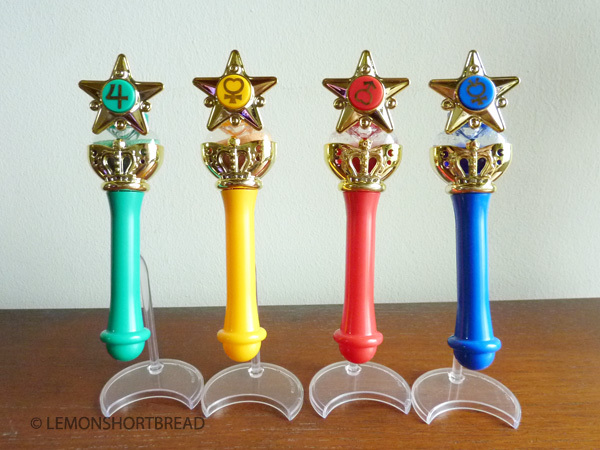 Pluto's wand is the silver one. 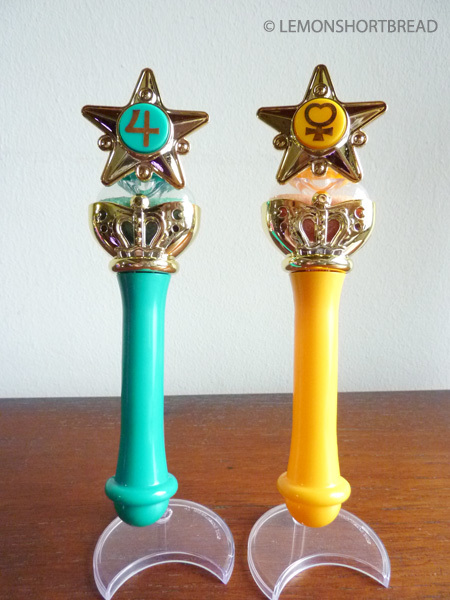 Some fan-made cosplay Pluto wands are painted purple or gray, possibly due to the anime. This set has no major problems except for this FINGERPRINT on the glaze! Someone at the factory didn't wear gloves hmm? 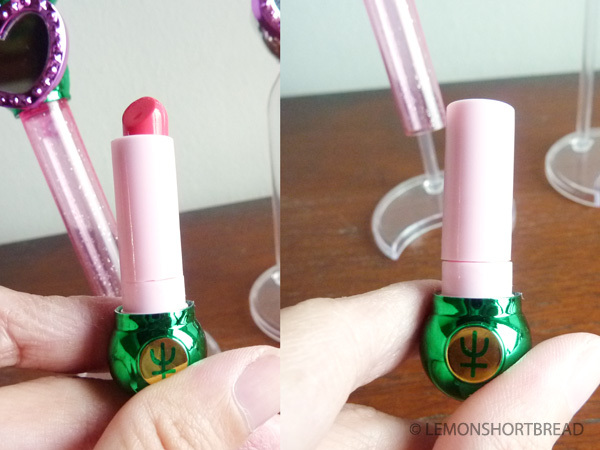 The lipstick is made entirely of plastic. It retracts, but is a bit stiff and wobbly. 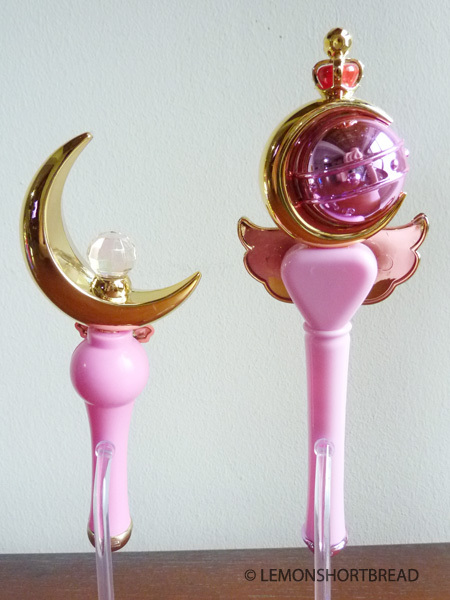 Chibimoon's Pink Moon Stick is okay, but pales in comparison to Sailor Moon's. 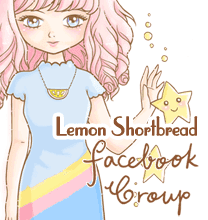 Very tempted to get the compacts now! 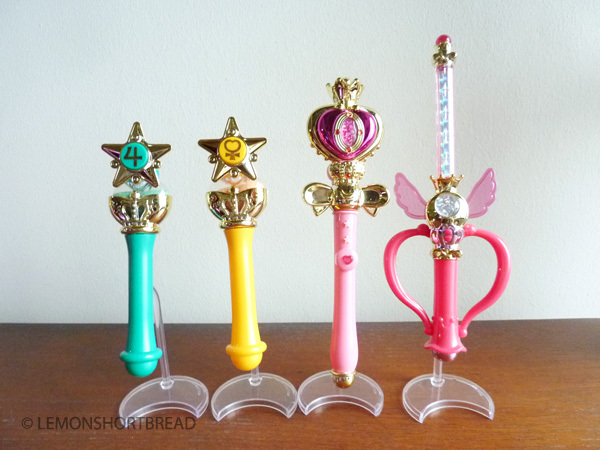 I do not have space for the entire wands set so I only put the Sailor Moon ones up. 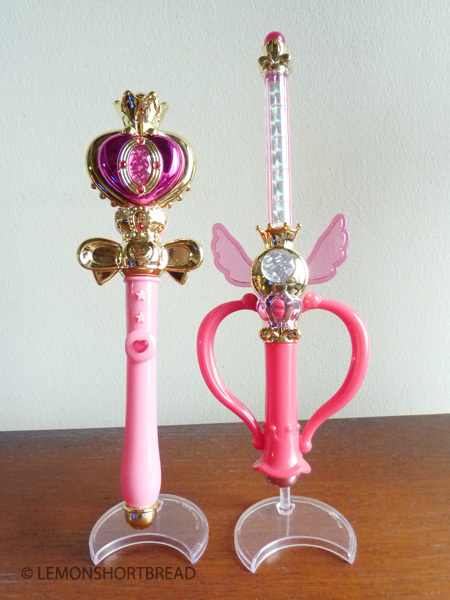 In conclusion, the pros are: they are affordable and cute, and for someone who wants a wand set in a good display size. 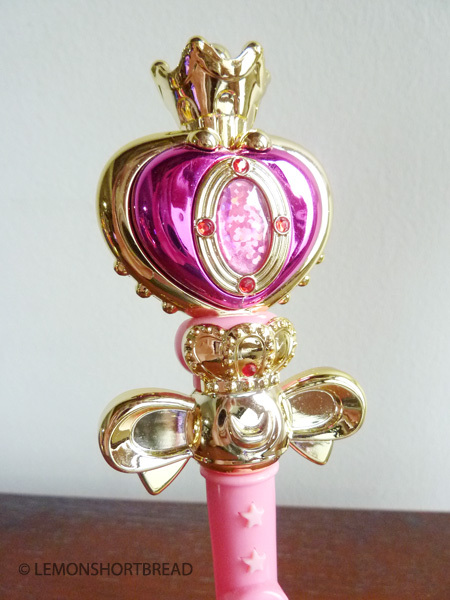 The cons are: the quality is lacking, and a serious collector may not like the cheap plastic material and accents.